If anyone can correct me or add some relevant information on this topic, please jump in. I'm no authority, I've just been reading up and I'm just posting this info here to get some discussion going. 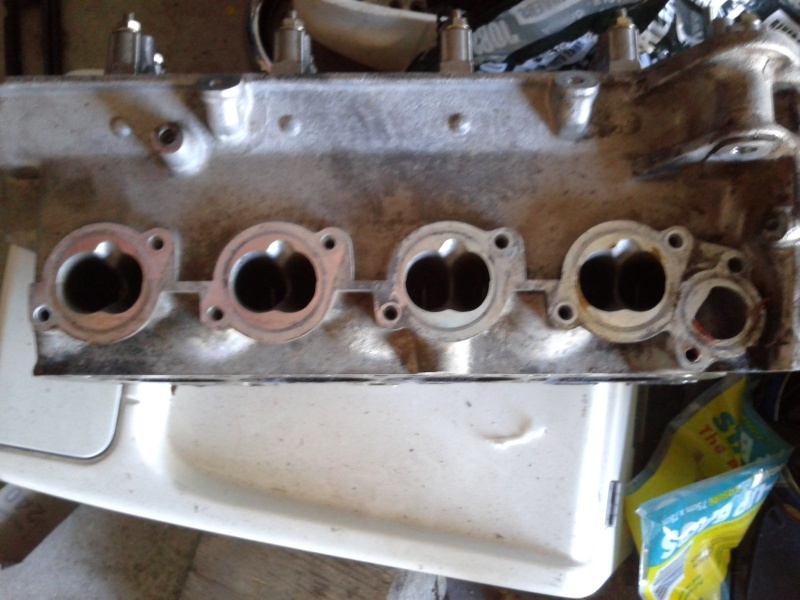 I just want to know whether a 4 hole injector will work properly in a K100 engine. There's been discussion here and on other forums about upgrading to 4 hole injectors to possibly get a performance boost. Fuel from these injectors is properly atomised by the 4 fine holes which also creates an efficient dispersal pattern. There doesn't appear to be a 4 hole injector specifically designed for the K100, so finding a substitution is the problem. The table below is one I've put together covering injectors that are relevant this topic or have been discussed here or somewhere else on the web in relation to the K100. Because air is measured as a mass, Bosch refer to the measurement of fuel mass in grams not cc's. However when bench testing an injector it's easier to measure the volume in CCs. Some interesting reading from Bosch. The first injector 0280150210 has been designed to run in the K100 engine and these are the parameters for the engine and ECU to operate within. The 'Pressure %' column is my calculation and refers to the available pressure provided by the fuel system divided by the required pressure for that injector. This injector requires 36.25psi to operate. The K system provides 36.25psi so therefore it's getting 100% of its required pressure. However when you get into the more modern 4 hole injector, things start to change. 0280150715 (4 hole) delivers slightly more fuel, but it's normal operating pressure is 43.5psi and in a K100 (at 36.25psi) it's only getting 83% of its required pressure, so therefore it's working with a 17% drop in pressure. These injectors require the higher operating pressure to get proper atomisation of the fuel. But if you want to go for a 4 hole injector then this is probably the one to buy as its the closest to the standard specs BUT is it operating efficiently?? 0280150415 (4 hole) is an injector being sold on US ebay as the injector upgrade for K machines (the listing doesn't state the OEM# but I messaged the seller for that info). As you can see this injector requires a much higher operating pressure (50.75psi) but will only get 71% of that required pressure from the K100 fuel system. It's working at a nearly 30% drop in pressure. Pressure and flow are directly related so that would mean that the flow rate would come down to 91grams/min. Thats a 12% drop in fuel delivery and a 30% drop in pressure. That cannot be efficiently atomising the fuel. Poor atomisation... poor air/fuel mix... poor combustion... drop in power. IMHO this injector is a bad choice. I read posts online from people who have fitted these and it really does seem unclear whether this injector makes any difference. Any percieved difference "may just be due to the fact that their old injectors were stuffed anyway" was one comment. It may be difficult to determine any changes in power output under normal use so I would be very interested to see dyna results and fuel consumption data before and after fitting these injectors. If the above assumption is correct, could a solution be to regulate the fuel at a higher psi by fitting a different fuel pressure regulator? Would you then need to install a pump to accommodate the higher operating pressure? The K fuel pump provides a head of pressure around 60psi. With increased fuel will the air regulate accordingly or do you get a richer mix? How would this affect the performance of the ECU? I'm just putting this out there and looking for feedback. I've tried to approach this logically but from what I can see we're probably better off sticking to the standard 1 hole injector. That's disappointing because I really wanted to upgrade. Good work Kaptain, very clearly summarised. Thank you for all the effort. I'd been considering the upgrade too and it looks like you've saved me some money. With increased fuel will the air regulate accordingly or do you get a richer mix? It gets rich. How would this affect the performance of the ECU? It won't affect the performance of the ECU, it operates on factory set parameters and the mass of air and temperature are the only governing factors as to how long the injectors are open for each revolution of the engine. My post above only refers to the K100 but if your K1 fuel system operates at 36.25psi which I think it does then the same will apply. I just presented the data with a bit of reasoning. You really need to assess that for yourself and make your own decision. 16 Valve Ks operate at 3 bar fuel pressure (43psi). @RicK G wrote: 16 Valve Ks operate at 3 bar fuel pressure (43psi). :smoke: :smoke: :smoke: ...... even on a Sunday. K1 and K100RS16V using the same FPR as the 8V models. The FPR w/o a vacum connection used on the K1100's is also set to 2.5 bar according to the OEM manual. @RicK G wrote: With increased fuel will the air regulate accordingly or do you get a richer mix? It gets rich. Then with reduced fuel (when using the 4 hole injector) it would be running very lean? Well I was going on what is quoted here for Bosch injectors and the test pressure. This is put together from a large PDF which I could only view so I cant post it here but was taken from screen dumps. The K100 is there and the 705 is only mentioned for a YUGO1.3lt whatever that is and when I found the 705 I put the "K1100 also" in. I also included the bit on the last line which I have seen quoted as being suitable for the K100 but it is only the pump from that model Mustang that is suitable and definitely not the injectors. I've found many sites with varying data but the sites that itemised 'test pressure' and 'operating pressure' seemed to be more reliable when cross referenced with Bosch data which shows flow in grams/min at 3 bar (43.5psi) regardless of their operating pressure. From what I can tell this is a standard. NB: The flows I've posted above are at operating pressure to get a working comparison. And every bloody one of them prints a disclaimer under it in very fine print saying if you quote us and it wrong its your fault and we then have the right to sue you for disseminating false information. Fiat models produced under licence you find about everywhere, with different names. And then of course the 705 is used on Fiat and others from mafioso land. This post is doing my head in (genes to blame?). However, Kapt. are you assuming reduced fuel via use of the 4-hole? The reason I ask is that I purchased the 4-hole injectors from this merchant, installed and ran them. Seat o' the pants dyno was smoother throttle and noticeably improved oomph throughout the rev range. Indeed, this could come from switching to reconditioned from OEM circa 1985 injectors but I have inspected the OEM's and they are actually very clean and booger-free at least visually. All told, I certainly did not experience a drop in performance of any parameter; quite the opposite. Interesting, Kyle. Have you measured fuel consumption since the change-out to 4-hole injectors? Mid to high 30's, as usual. @Kyle10 wrote: This post is doing my head in (genes to blame?). That was the seller who messaged me back to say his injectors were OEM#0280150415. Maybe you could confirm the OEM# for the injector you have? It may be different. But with respect Kyle, I have no idea what "Seat o' the pants dyno was smoother throttle and noticeably improved oomph throughout the rev range" really means. I cleaned my injectors and re-kitted them last weekend and I can say I have a smoother running machine now. Some may translate that to feels like more power. Just on the side... My rudimentary testing and cleaning showed that one of my injectors was leaking. The cleaning seemed to fix that. Might explain my high fuel consumption and smelly exhaust. I'm hoping that's the cause, I'll know at the next fillup. There are plenty of fuel injector calculators that take the guesswork out of what size/cc injector to use when trying to match closely. But an injector that is 146-147 cc/min @ 44 psi will work well. Just make sure that they are high impedance. I'm with your reasoning on this, actually, and hedged accordingly in my orig. post. Albeit, since obtaining the bike (from my Dad) I've put about 16K on it in all but snowy environs so the improvements I noted were obvious to me: smoother idle, crisper throttle, more grunt - to what degree specifically I could not put in hard data. And the bike's no hard luck scrape-the-grime-off story. I'm the second owner, as my dad bought it new and its been cared for well over the years. The slightest hiccup and to the dealership my dad would take it, he being afraid of all things involving wrenching (as opposed to involving 'wenching'). @Brad-Man wrote: There are plenty of fuel injector calculators that take the guesswork out of what size/cc injector to use when trying to match closely. But the OEM FPR is ~37 psi, right? Is a higher psi regulator something to consider? Would an adjustable adjustable FPR (example) be applicable/wise/sane? Set to ~44 psi? Hi there, I still got the tables compiled during my injector replacement a few years ago, the 715(4 hole) will give 151.3cc/min at 3 psi, and the 210(1 hole) 145.6cc/min at 3 psi, the difference is a mere 3% and lower at 2.5psi. So you should not have any problem with the 715 injector. The 4 holes better spray pattern, may increase power and reduce fuel consumption. the high fuel smell out the back of out bikes is usually a good sign that there is a good quantity of unburnt fuel .. I can see clearly that the better atomisation, no matter the delivery pressure (within reason ) is going to make some differences in a positive nature . our mate "bert2" did a adjustable fuel regulator upgrade before selling his beast ...with noted improvements in performance ..and some little differences in fuel economy . @japuentes wrote: Hi there, I still got the tables compiled during my injector replacement a few years ago, the 715(4 hole) will give 151.3cc/min at 3 psi, and the 210(1 hole) 145.6cc/min at 3 psi, the difference is a mere 3% and lower at 2.5psi. So you should not have any problem with the 715 injector. Yes JAP I tend to agree also. I pointed out in my OP that the 715 would be the better choice over the 415. The way I look at it is.... any percieved power increase from a 4 hole injector is not worth worrying about. There's not data to back it up, just a lot of vague comment about maybe its better but not sure type of thing. Im happy with the grunt my K has and its getting better as I bring the servicing up to date. I've decided to replace my injectors but I'll be going with the standard 210. To each his own, of course, yet it is doubtless converting to 4-hole injectors has bettered my bike. I think you mean 3 BAR - not 3 PSI. Yes I meant 3 Bar and no I didn't. I supported your conclusion by using concurring data from an independent source. An object at rest, CANNOT BE STOPPED! Very interesting post this, which I think has many followers, I looked at what is available to us "Europeans" and found this site. I had to read that twice. At first I thought it was 80Eur for one injector! - until I read the rest of the page. That's a pretty reasonable price. Price is not bad for a set but it is an exchange service for the 4V injectors. Would be good to know what the OEM # is. Plugs pulled at a paranoid 2-week mark of riding, again at two months and for a last time before the to-the-frame strip for the winter. All told 5 months of riding, incl. highway (I-5 b. Vancouver and Eugene), coastal roads and horrible in-town-I'm-sweating-to-death traffic. Plugs remain looking as they should (lt. gray dusting). I have the 415 injectors on my project bike. I also have an adjustable FPR, and am in the process of installing a wide band 02 sensor to be able to monitor the exhaust gasses. So In a few weeks I should be able to provide a more objective analysis and see if there is any noticeable difference in running the 415 injectors at 2.5 bar, or the 3.5 bar they are designed for. #415 injector at 3.5 bar will deliver nearly 30% more fuel than is required. Probably a bit rich. Adjusting that to 2.8 bar (40psi) would get you the required 103 gr/min for a 2V K... no problem. 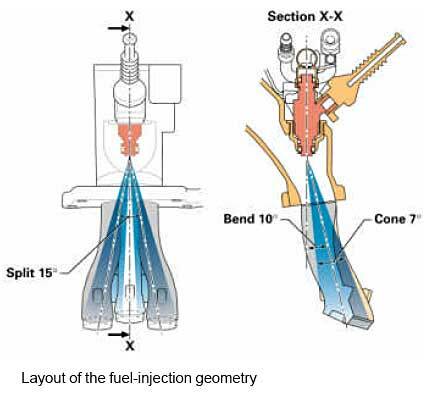 BUT the info I've been able to find on that injector says it has a 13º 'Split Stream' spray pattern plus it's offset, designed for a BMW car engine, so I'm guessing there will be some fuel/efficiency lost getting it to the port and into the combustion chamber. That's an inherant problem with port injection and why spray patterns are designed for specific intakes. This is sort of how it works BUT the 2V K only has one inlet port per cylinder. The #210 (which was specifically designed for the earlier 2V K) with single hole pintle is designed to spray fuel directly to the back of the inlet valve. The setup is similar but a little different for a 4V. Dave, I'm not saying the #415 is no good. I just think that 'on paper' it doesn't look optimal so I'd be very interested to see your O2 results. However that will just tell you the correct fp for that injector. How is that going to affect fuel consumption? the whole thing starts to become a can of worms. all very good .....but ....the 2 valve has only about 25 -30 mm between the bottom of the injector and the valve AND the intake is not straight on there is a bend in the intake port of about 10 - 15 degrees if you cared to look . perhaps swirling concepts were designed in as well . there is empirical evidence of performance differences on other forums to do with the mighty k bikes . For many this could end in poor or mixed results ....but please provide feedback ..........im not pointing to the purists but to the adventurist types with the interest at hand . 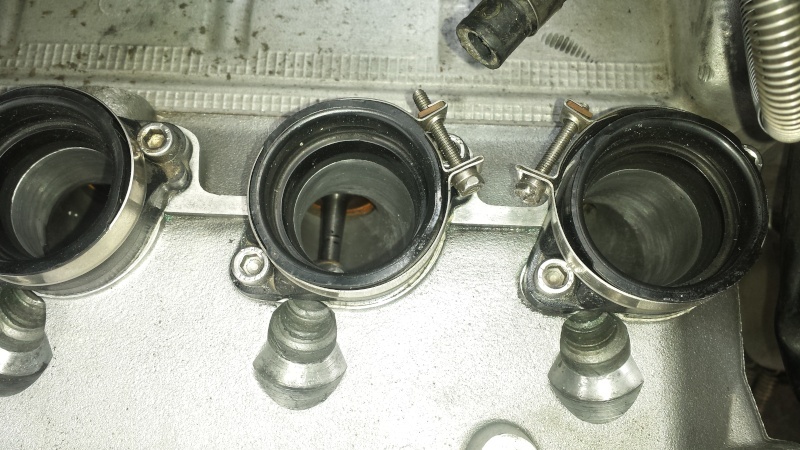 Yes you are correct, there is a bend in the air intake manifold but this is about injectors and the injector is pointed directly at the back of the valve head. It was specifically designed that way. The picture I posted was only to highlight how the #415's split stream setup works. There is no relationship there to the K intake mainfold 2V or 4V. I did mention in my post above that the 4V set up is a little different, but this thread and specifically my post above refers to 2V Ks. I've not found any imperical evidence on other forums supporting performance improvements with 4 hole injectors in a 2V K100, just a lot of vague chatter including posts that suggest that maybe the original injectors were old and unserviced and installing anything new would've been a noticeable improvement. I dare say that someone here would've pointed to any evidence by now. If its out there, please, someone put it up. Interestingly, the US ebay seller of the #415 makes no mention about the suitability for 2V or 4V however other more prominent retailers selling an upgrade injector online actually state that they are for 4V only. Anyway, I make no assumptions. I'm just trying to get a discussion happening so K owners can make an informed decision about replacing injectors if they feel they are the adventurist type. I'll wade into the bog to say that replacing my original K100 8V injectors, rated at about 130cpm, with 16V K11 injectors, rated at 150cpm (same as K12RS/GT, incidentally), produced an overly rich squirt as evident by the smoot at the tailpipe egress hole and the slightly reduced mileage per litre, with no real increase in ooomph. This was done after installing 35mm TBs from a K11 in place of the stock 33mm TBs. I'll go back to cleaned-up, 8V injectors when I return home this year. There is perhaps some comfort in the idea of a four hole injector atomising the fuel better than a single hole injector for more efficient combustion. sounds like they would be getting close to equalizing my lean mix (after port modification ) dazza I have an awfully clean tip at the rear end and running hot as . the adjustable fpr is going in real soon, Karuah is just around the corner . Ah, Karuah. I remember that rainy year. Wait a mo', it rained every year I went! Have a great time. When I read the news (daily) from OZ and look at the weather forecast (twice daily. Tragic, I know) I get a wee bit homesick. There's something about dark, grey, cloud-covered days in the Pacific North West that make a man wanna jump on a bike and head south to warmer climes. It's such an indoor lifestyle up here, but at least it's not too cold. But where's that bloody sun?! Moles, that's what we resemble. I'd better get back to putting this project K together. I'm not going to lie, but this thread, and the online research it provokes is really hurting my brain. 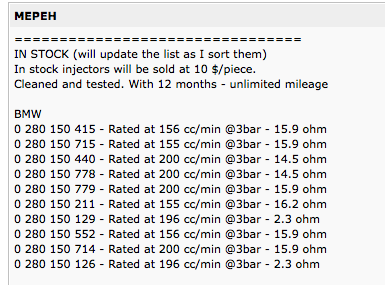 I took a screenshot of some numbers this dude recorded of BMW injectors in the bimmerfest.com forums. There are physical differences between Bosch injectors. 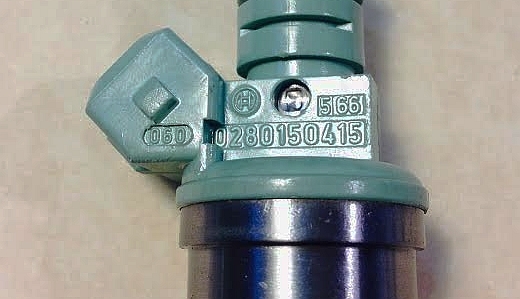 An R1100 oilhead injector, won't fit an R1150, for example. @charlie99 wrote: sounds like they would be getting close to equalizing my lean mix (after port modification ) dazza I have an awfully clean tip at the rear end and running hot as . Lean Mix Charlie, aren't you going to change the map flap to instruct the cpu to deliver the fuel you want? # thanks Kaptain. Taking up this older thread. For my K75/91 I just purchased and installed the 415 (4 hole) and I have a smother running machine. There are many on the marked for cars, I don't know if refurbishing the old original would have given the same result. Originally Bosch Nr 0 280 150 778 ??? So what psi did you end up with Charlie I note 2.5bar =133cc/min and 2.7bar =144 on the injector ratios bosch site for a 208 so maybe our 210 delivers the same? note I retracted the afm springing back to 1 click down from standard ,( could have left it at 2 clicks down in spring tension but felt that economy would suffer greatly ) ...and relocated the wiper to achieve 1.16 volts on closed throttle instead of the 1.68 or something that I read as static settings before I started on this particular afm . thats from memory .